I am a casual gamer. As in, very casual. Like it says in my bio-thing at the bottom, I'll play for a while, and then just sort of forget they exist. I loved Borderlands 2, and it took me, oh, about two years to actually play through it. Video games are in a cool place right now, they look amazing, they tell some amazing stories that are immersive, so I'm not knocking them or saying I have some great position on them. THESE. I WANT TO PLAY AS THESE. As that very casual gamer, I am stupid excited for Battlefront 2. The original two may be my favorite games of all time. Not because they are so immersive, tell great stories, etc, but because they don't. The best part, for me, is that you can literally play it for a few minutes, and then walk away, and not have to remember much when you pick it up again a few months later. And while the mutiplayer aspect that nearly every game has that side now, that's the beginning, middle and end of the first couple Battlefront titles. You can't do that with Fallout, Skyrim, etc. 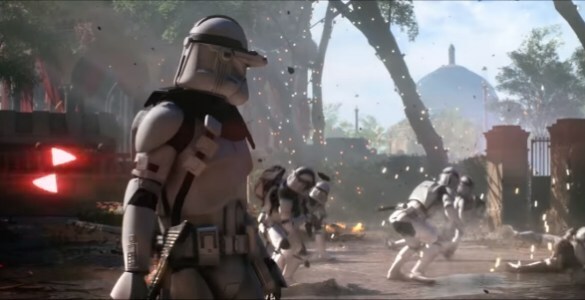 The new one has a campaign, and it looks pretty awesome, but we're here for ground level troops dukeing it out on the best battlefields in the Star Wars galaxy. At least, I thought that's why were all here. Apparently, I was wrong. It's all about getting the most powerful heroes and being able to wreck shop. If you pay attention to video games even a little bit (like, say, as little as i do), you've heard about this. It takes roughly 40 hours of gameplay (three years in Real Dean Time [RDT]) to unlock Luke or Vader. This I am fine with. Again, Battlefront is supposed to be about the troops, not the Jedi and Sith and whatnot. The real problem comes in where the game has a micro transaction system wherein you can just buy credits outright, with your real monies, and thus unlock said heroes. All told, it costs about $800 to unlock all the heroes. In a sixty dollar game. I have read comments such as: "that's like making me work a second job that pays less than minimum wage!" which, no. It's a game. No one is making you pay for heroes, players just want shortcuts. It's the same mentality that ruined the Old Republic MMORPG - players were so concerned with getting to level whatever as soon as possible, they never, you know, played the game. For me, and others like me, tagging along with our dinky lightsabers and level 12 or what have you, it got boring in a hurry - which is too bad, because the game itself was a delight. I'm sure some of this sounds very "get off my lawn", and maybe it is. There are a million games out there - good, fun games - that are suited to getting the heroes, the upgrades, the best gun, armor, etc. That's not what this game is, though - or should be. Dice could have easily avoided the whole mess by not having microtransactions at all. By having heroes be earned in a reasonable manner, and not making them such a key part of the game. And then make a game centered around Heroes that has good lightsaber controls and I am in. For, like, a month at least. Dean is the author of the 3024AD series, is an aficionado of good drinks (extra dry martini; onions, not olives), good food and fine dress. When not holed up in his office tweeting obnoxiously writing, he can be found watching or playing sports, or in his natural habitat of a bookstore. He also has an unhealthy obsession with old movies and goes through phases where he plays video games before kind of forgetting they exist. He lives in the Pacific Northwest and likes the rain, thank you very much.